Today the Federal Reserve will makes its most consequential announcement in years. Much attention has rightly focused on whether the fed funds rate is increased. Ultimately though what matters is the posture of monetary policy, which depends on both the fed funds rate tomorrow and the path of expected rates. My views are clear; this is not the time for a tightening in monetary policy. Whether the fed funds target is increased or not is obviously an indicator of monetary policy. A better reflection is the 2 year Treasury rate which is largely determined by expectations of the fed funds rate the fed will set over the next 2 years. It is this 2 year Treasury rate that I will be watching as the market digests the Fed’s policy announcements and forecasts and Chair Yellen holds her press conference. I think it likely that the 2 year will move contemporaneously with the fed funds rate. If rates are not raised I’d expect the two year to fall and if they are raised, I’d expect it to rise. But this is not certain. A “hawkish” holding of the rate where the Fed moved towards locking in future increases could raise 2 year rates. Conceivably but less likely a “one and done” type announcement could on balance lower expected rates and so 2 year yields. 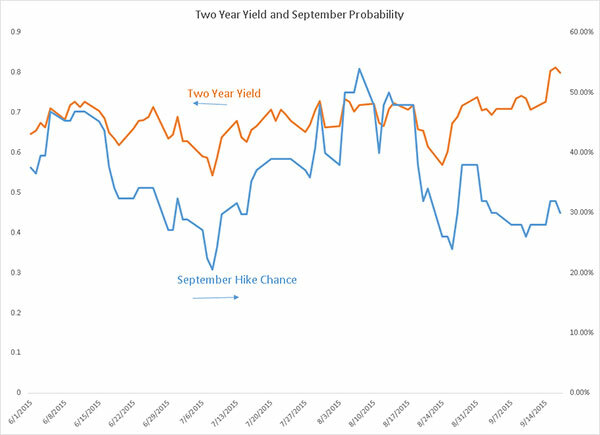 The figure below shows that two year yields and the chance of a rate increase in September have mostly moved together but that very recently markets have started to anticipate policy tightening that is not rooted in a September fed funds hike. I see a risk that the fed will not move this afternoon but will appease hawks with such firm language on future rate hikes that their overall impact will be contractionary. This would be very unfortunate.